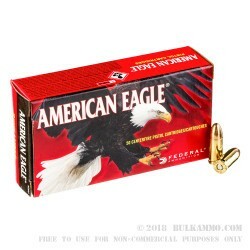 Federal's American Eagle line of range ammunition is an affordable way for you to keep your shooting skill sharp. 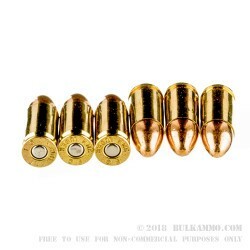 This 9mm ammo is loaded with an accurate and middle weight 124 grain full metal jacket bullet. This ammo is an excellent choice for pistol shooting drills, as well as for shooting competitions like IDPA and 3-gun. 124 grain bullets are a great match with compact pistols like the Glock 19, and with full size pistols like the Glock 17; but might be a bit snappy with sup-compact pistols like the Glock 26. 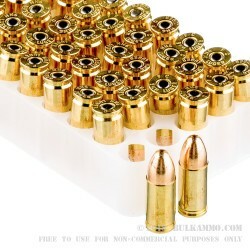 Each round is loaded with a Boxer primed brass case and is reloadable. Federal American Eagle ammunition is manufactured at the Anoka, Minnesota plant, along with Federal's Premium lines of ammo. The same care and quality control goes into making all of their products. Overall, great ammo for any purpose.